"Pianeta has done a decent job of rescuing his career but always seems to come up short when stepping up in grade – beaten in a round by Chagaev and seven by Johnson"
The Tyson Fury show rolls into Belfast as the undefeated heavyweight takes his second step along the road to recovery. Many thought it would be a marathon but there's suggestions a world title challenge against WBC ruler Deontay Wilder is nearing, something Fury himself is keen to push. 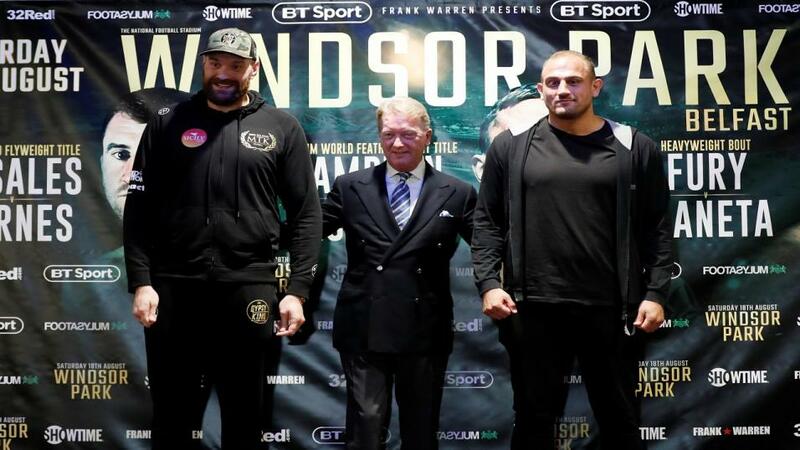 That has people talking but the Englishman must first pass what has the potential to be a tricky test in experienced Italian Francesco Pianeta, a man who has shared a ring with the likes of Wladimir Klitschko, Ruslan Chagaev and Kevin Johnson. He's a big price underdog, of course, but what's the chances of him ruining the party? Fury returned to action with a simple win over Macedonian Sefer Seferi earlier this summer, moving the beaten man's record to 23-2-0 with a fourth-round stoppage. It was a result most expected but Fury was cut some slack by critics, given his time away from the sport and personal problems. He may not be the most popular man in British sport but there's no doubting boxing is a better place when the 6ft 9inch orthodox is involved and in the mood. Fury talks a good game - see his active Twitter feed for proof of this - but he's also a talented fighter and isn't one to shy away from a challenge. Deontay Wilder - 40-0-0 with 39 KOs - laid down the gauntlet and Fury was quick to accept, even promising to go to America and knock The Bronze Bomber out. Easier said than done but it'll all count for nothing if he fails to deliver against Pianeta on Saturday. No surprise to see he's hot favourite, [1.03] on the exchange. A 20th career stoppage win and second on the bounce is 3/10, more appealing than the points verdict at 5/2 - both Sportsbook offers. Never heard of Francesco Pianeta? We won't mark you down for it. It's perfectly understandable, but there are a few decent names on his CV and he was undefeated in his first 29 before coming up against Wladimir Klitschko back in 2013. The 6ft 5inch southpaw made it to the sixth round before being pulled by referee Ernie Sharif in Germany. No one will hold that result against him. Since then Pianeta has done a decent job of rescuing his career but always seems to come up short when stepping up in grade - beaten in a round by Chagaev and seven by Johnson. The underdog has lost two of his last three and that goes some way to explaining why he'll be friendless on the night, even at [30.0] to win the fight (Exchange), 33/1 to land a knockout or 100/1 to impress the judges. Big prices but it shouldn't see too much attention. There's no doubt he has taken another leap up in class here and will suffer career defeat number five, four inside the distance.